They look like they're coming out of the picture. I like how the shapes look like they are sitting on top of the paper. I like how they drew the shadows. It makes it look more realistic. 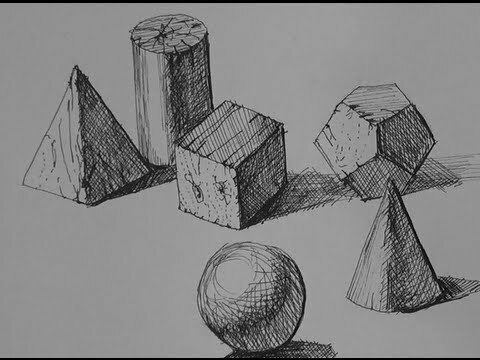 The artist did a great job of shading the simple geometric forms and turning them into 3D objects. This looks difficult but also very cool. They look really cool. I like how the shading can make them look like a totally different picture. They're cool. It's interesting how many different shapes can be made from simples shapes such as the circle, square, and triangle. Erin Brown. I am excite to learn how to shade different shapes. I am very eager to learn how to draw and shade all of these shapes. This will help me perfect my own talent. The shadows are very cool. I like how 3D they look. The shawdows from shading make them looks 3d and somewhat difficult to draw. I like how the shapes look 3d! I like the shadow, the shadow looks very cool, and these images look very solid. I like how the shading of the shapes gives them 3d look while only being 2d. I really like the shadow that makes the image 3D and looks real.